In the face of this trauma that would kill hundreds of thousands, a shell-shocked gay community and supporters mobilized with the movement that began in New York, spreading to other cities and internationally. 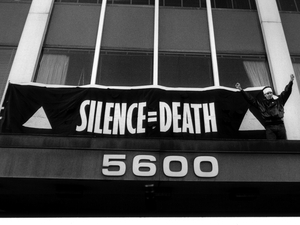 “Act Up Fight Back” became the movement’s rallying cry and helped provide purpose for those fighting the AIDS epidemic as they sought greater attention, resources, and swifter delivery of drugs to treat the disease.How to Survive a Plague vividly captures a period in American history just long enough ago that people in their early forties and younger might not have an appreciation for what it was like for a community to face both systemic discrimination and a devastating disease. I was struck by how self-aware the community of activists who fought the AIDS crisis were in documenting their struggle through video. Many if not all actions were accompanied by videographers, whether it be Catholic church services where activists disrupted Mass or the wrapping of Senator Jesse Helms’ Washington house with a gigantic condom. The footage in this film is understandably largely New York-centric, and there were other cities with vibrant ACT UP scenes, both in the United States and abroad. The ACT UP Oral Archive has interviews with many other figures from the scene, and another film on the subject,United in Anger, is also set to be released this fall.These minor reservations aside, I found How to Survive a Plague emotionally resonant and evocative. I was in my early teens at the time, living in Texas, scarcely aware of ACT UP and the wider AIDS crisis. My interest in the subject came about in the late 1990s, just as the global scope of the AIDS crisis became apparent. While I had heard of ACT UP, the film makes you feel present in the vibrancy and sorrow of the period that only a video medium can. The film is going in to wider release this fall, and I encourage you to see it.